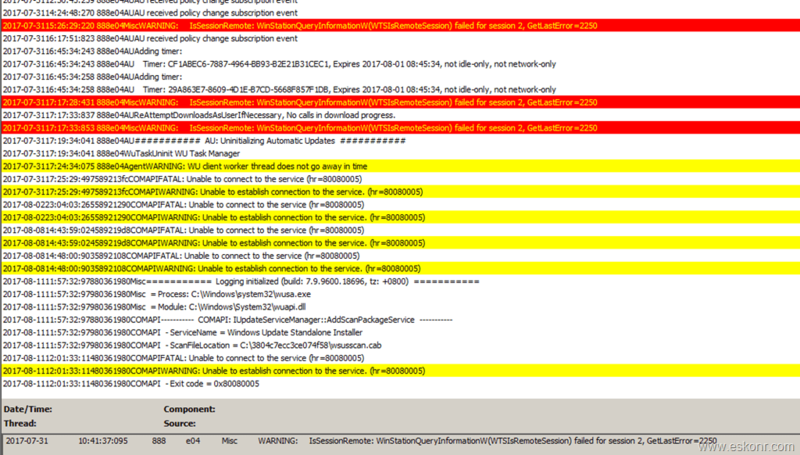 To manage software updates using SCCM/Configmgr, software update scan (with help of windows update agent) is mandatory without which ,client cannot download the update catalog (metadata) from WSUS and perform the scan for letting the server know what is required and what is not required using the state messages. When i was looking at the software update scan reports few days ago ,identified some of the clients (Windows servers) could not able perform software update scan. So i decided to take look at the one of the client logs and troubleshoot further. After logging into the server ,looked at wuahandler.log ,scanagent.log and windowsupdate.log as these logs will help you help to troubleshoot software update scan issues at the initial stage. Below is windows update log. 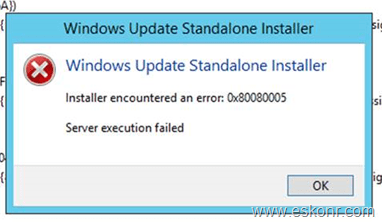 After seeing this error ,i tried to stop windows update service but windows update service stuck at “stopping” status (hung) and never finish . So i have to kill the service to stop using taskkill command. I even tried installing the updates manually to see if that goes through but that also failed. How do you know the issue is related to missing/corrupt wmi class ? For this ,you need to create dump to analyse what is going on and here is what found in the dump log. From the dump log ,We can see the hang is due to waiting for WBEM. WBEM is Web-Based Enterprise Management, and its Microsoft implementation is Windows Management Instrumentation (WMI). When Windows Update is in “scanning for updates” state, the WMI provider in use is ServerManager.DeploymentProvider. Below command is to compile servermanager.deploymentprovider.mof . If the ServerManager.DeploymentProvider is bad, this command will fix it. If the ServerManager.DeploymentProvider is good, below command will not cause any damage to the machine. Thus running this command is the troubleshooting action I chose. After the server reboot, software update scan went through successfully. I could not able to find a way to check whether ServerManager.DeploymentProvider is good or bad but compiling the MOF do not harm the server and that also fix the issue.